This hard work can take its toll on your water heating system, resulting in a need for maintenance and, in time, replacement. In this blog post, we’ll share five things you should know about your water heating system… that your plumber may not tell you. Most tank heaters are designed to operate smoothly in a wide range of settings, but they still need to be maintained – and as they get older, replaced – in order to work their best. Without the right amount of maintenance and care, your tank heater could rupture due to pressure and wear, causing a small flood. As water spills out, it could lead to property damage that affects your home’s interior and structure. Concerned? 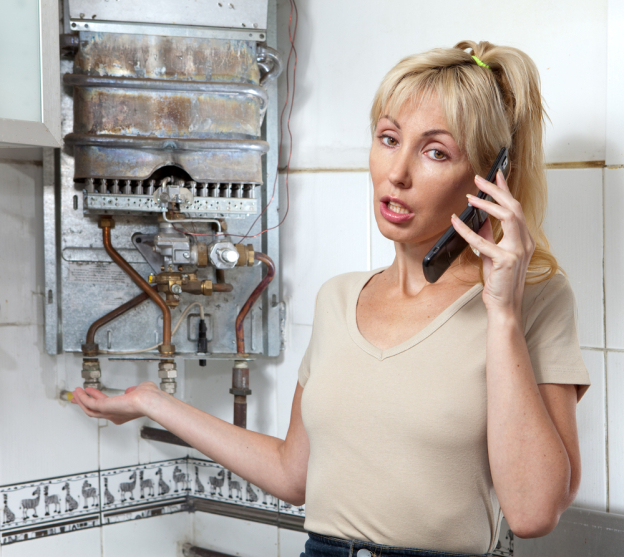 You should be – a ruptured hot water tank is a serious liability that any homeowner should be aware of. If you’ve got a tank heater, check its model number to learn more about its durability and maintenance requirements. Most people choose tankless water heating for its convenience and comfort. Endless hot water is, after all, a major selling point. But there’s another key benefit to going tankless that many people aren’t aware of: its significantly lower energy usage. Tankless water heaters use, on average, about 20 percent less electricity than tank heaters. Over a year or two, the energy savings your tankless hot water heater leads to could be several hundred dollars, or more if you’re a heavy water user. Many people are put off going tankless because of the higher-than-average costs of purchase and installation. However, it’s worth remembering that the lower energy consumption of a tankless heater goes a long way to neutralize the initial expense. Did you know that your home’s water heating system is a marketable benefit if you ever decide to sell and move elsewhere? Tankless water systems, in particular, are linked to higher property sales prices and increased desirability. The reasons for this are numerous. One is the comfort and convenience of tankless hot water. Another is the energy efficiency of going tankless. A third benefit is lower greenhouse gas emissions – a major selling point in many communities. If you’re interested in selling your home in the future, your water heating system is worth paying attention to. With the right choices, you could increase your home’s value by several thousand dollars simply by choosing the right water heater. Water heaters are like any other type of machine; in order to work their best, they need to be serviced and maintained. Over time, sediment can settle in your water heater and reduce its efficiency over time. In addition to this, poor maintenance can lead to rust developing on the inside of your water heater. This can lead to reduced efficiency and a greater risk of floods and structural damage occurring; a risk no homeowner wants to consider. These problems can be avoided by draining your unit annually to keep it working at its best. Other basic water heaters plumbing and maintenance, which can be carried out entirely by your local plumber or hot water specialist, will also improve its performance. Water heaters don’t last forever. Over time, tank heaters become less efficient and also significantly less safe, with their ability to heat water and withstand the great pressure of tens of gallons of hot water progressively decreasing. On average, tank heaters last for 10 to 12 years before needing to be replaced with newer units. Tankless heaters, on the other hand, can last for up to 20 years before their efficiency level decreases significantly. If your water heater is more than 10 years old or you’re noticing typical signs of its performance declining – for example, unusual smelling or lukewarm water – it may be a sign that it’s time to replace it with a newer system.